Happy Year 3 Celebration to T for Tuesday! Stop by Bluebeard and Elizabeth's blog for the party! So today I have a new insulated mug to show you for T Day. My brother-in-law was telling me about his Yeti tumbler on the 4th of July. He said it keeps his drink cold all day at work, and then the next morning, it is still cool. My hubby has a Yeti can/bottle holder that I got him for Christmas which works as well keeping a bottle or can cold for a long time. Well I was sick of the warm watered down tea and all the condensation drips, so I happened to be in a store last weekend during my road trip north and saw these Yeti tumblers. So I decided to splurge on one for myself. Last week I was experimenting to see if it worked as well as Yeti advertised and as my brother-in-law said. Here's my first cup of tea for the day. You can see the time I poured it. Time for another refill. But this is the same ice as in the morning. A little melted, but still there. And I need more tea. Still, the same ice. A little more melted, but keep in mind we were having a hot day! And I made a fun little journal page with some ice, but it must not be in my Yeti mug because it is melting. I'm linking up to Try It On Tuesday. The new challenge is Make Us Smile. I used these fun stamped angry penguins from Katzelkraft. They're not happy their ice is melting. Ha-ha. Best thing to do when its hot is sip my COLD tea and read. Makes me happier than those penguins. And here's a book I read that was only so-so. It had good parts that I enjoyed and then all of a sudden it would drone on. Then it would pick up again. 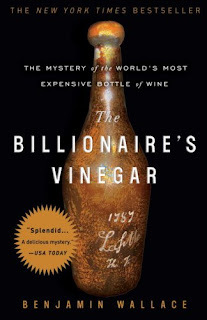 But I did learn a little bit about rare wines, and a bit about the fake wine market. So when that was finished I moved onto these 2 books. 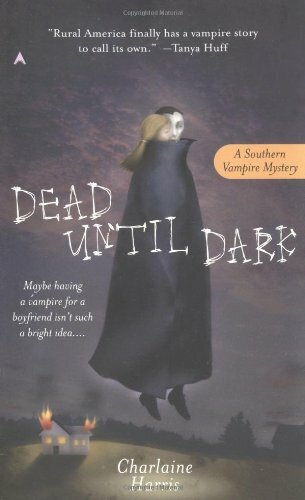 I read this Vampire book years ago and pulled it out of my stash. Its a fun read. I wanted a light and fun read after the wine book. This is the book that initially inspired the HBO show True Blood, and is the first of the whole set of Sookie Stackhouse novels. 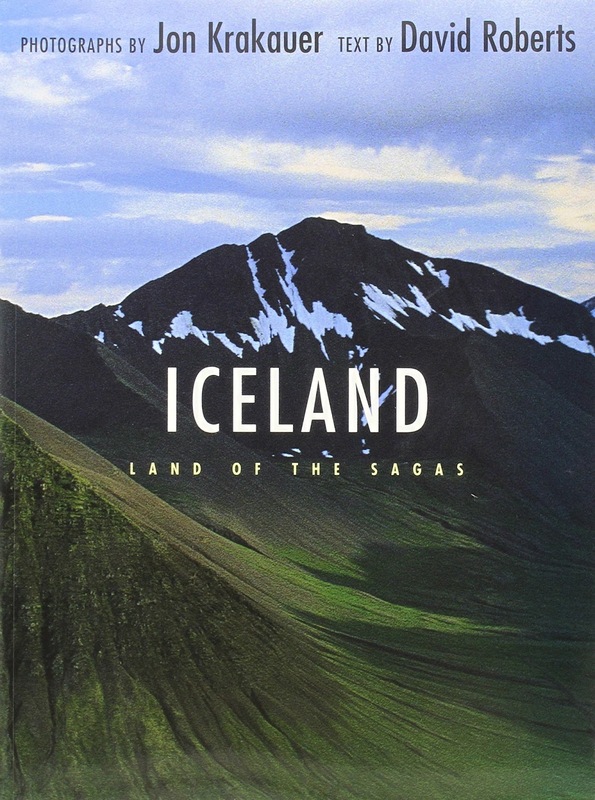 And this is an interesting book about Iceland. I buzzed through a lot of the saga info, for although interesting, not what I was up to reading. But I finished the book in a night. The photos are pretty cool too. I'm getting excited, can you tell? OK, I've babbled on quite bit today. Stop by and join up with the T gang on this celebration Tuesday. And hope your Tuesday is a great day too. Love the penguin art!!! I've thought about getting one of those mugs too. The mug I have is getting old and doesn't work as well as it used to :( I've been reading like crazy this summer too. What I do when the sun goes down. Something about the name "Yeti tumbler" that is really catchy and fun. 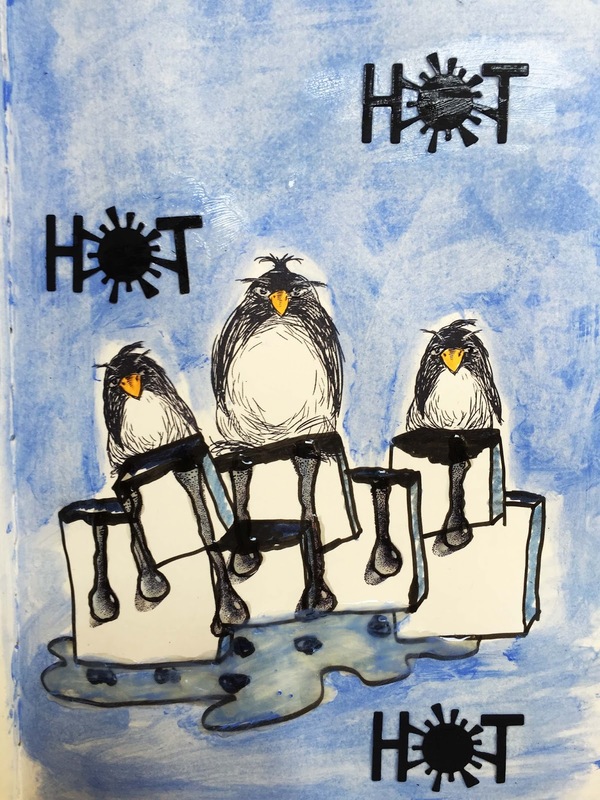 Your angry penguin creation is very inventive with the melting ice and the colors you chose give a nice effect. I like your ice theme for our hot and humid weather but must confess I am not a fan of ice in my drinks. Just as long as it's wet is all I need. I bet those yeti mugs are flying off the shelves as so many people in the US love their ice cubes. Iceland is getting closer for you Erika yippee yay! So will you be drinking ICED tea in Iceland, or will you break out the teapot? Thought your ice experiment was wonderful and now I know what mug to buy if I want my coffee chilled. It's always fun to listen to a genius, even if it is a relative. Your art was fun and funky. I thought it was perfect for TioT. I had no idea penguins got angry. Thanks for sharing your books, your art, and your tea and ice experiment with us for T this Tuesday. And thanks for your wonderful supportive comments. i had to grin about the penguins;) and i´m with you about the annoying condensation Thing. i will look out for those Cups here, too. I am going to look out for these Yeti tumblers and see if they are on sale in my place. Our weather is turning to rainy days and some area have got flooded! But we are also feeling more cooler these days. Wow! I am impressed by your Yeti mug! I must google that and have a look. Impressive to say the least. I smiled at your journal page with the melting penguins. It is not so hot here these days. (Fortunately) All the heat has gone to northern Europe where they are having a mini heat wave it seems. Your book about Iceland looks interesting. I find Iceland fascinating and it is on my bucket list. I find it interesting from a geological point of view, but I am also interested in their culture, because of the importance of women. I mean they have woman leaders in all parts of life, in business, in politics etc. I hope one day you will get to visit Iceland and then tell us all about it! PS I forgot to say: About ATCs: Am I right in thinking you will be sending an ATC to me? I can't find your contact form to send you my snail mail address, but if you send me your email address on my contact form I will contact you via email. (sorry, that sounded very complicated). Wow that cup looks amazing , to keep the ice for all those hours. I bet it was a refreshing drink as well. I love your journal page with the penguins, they did make me smile. thanks for sharing it with the TioT's gang. Well, it looks like you made a good investment with your yeti tumbler! Love your art page and the adorable angry penguins:):) Nothing like good reads especially for summer. I just got two new ones and am waiting on another order! Personally I prefer buying mine because I read non fiction and mostly travel and or cooking stories and I like to highlight and mark things. Happy T day!! My younger son would love your tumbler. I'll have to tell him about this. 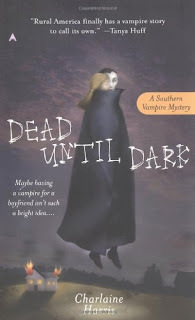 I've read a few of the Sookie Stackhouse books but have never seen the tv series. I haven't seen the other 2 books, but they look interesting. aww poor penguins - just as well they can swim. Your penguins and the whole post brought a big smile on my face! Great that you linked to TioT dear Erika! images. I really love it! I have heard of those Yeti mugs before but honestly didn't believe the hype...thanks for the real life demo. I may invest in one myself now! I will need your snail mail address as you are after me on the list. I must tell you in advance though that my last few days have been crazy. Today is the icing on the cake....had my drivers side window blown out while driving 50mph in the center lane of the hwy...glass everywhere...crazy time! I'm ok...a few minor cuts and a van in need of a new window. I will get the ATC finished ASAP. Oh poor penguins, they do look cross and quite rightly too. I wonder what an angry penguin can do? It's always interesting to see what others are reading, so thanks for these suggestions. wow, have never seen a Yeti cup...but that is amazing! L♥ve those penguins. Adorable! Happy Summer! Thanks for the info on the Yeti tumbler. 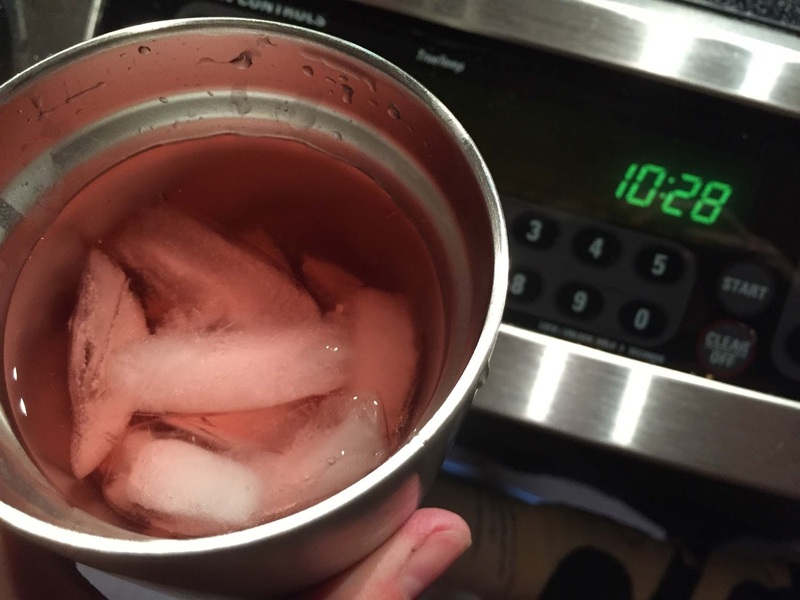 I had heard of yeti coolers and how wonderful they are but the tumbler makes more day-to-day sense.